From fashion to print shops, Shopify is a great resource for building Ecommerce platforms. Shopify makes it easy to sell goods online – where you can showcase your store and have an online checkout option. 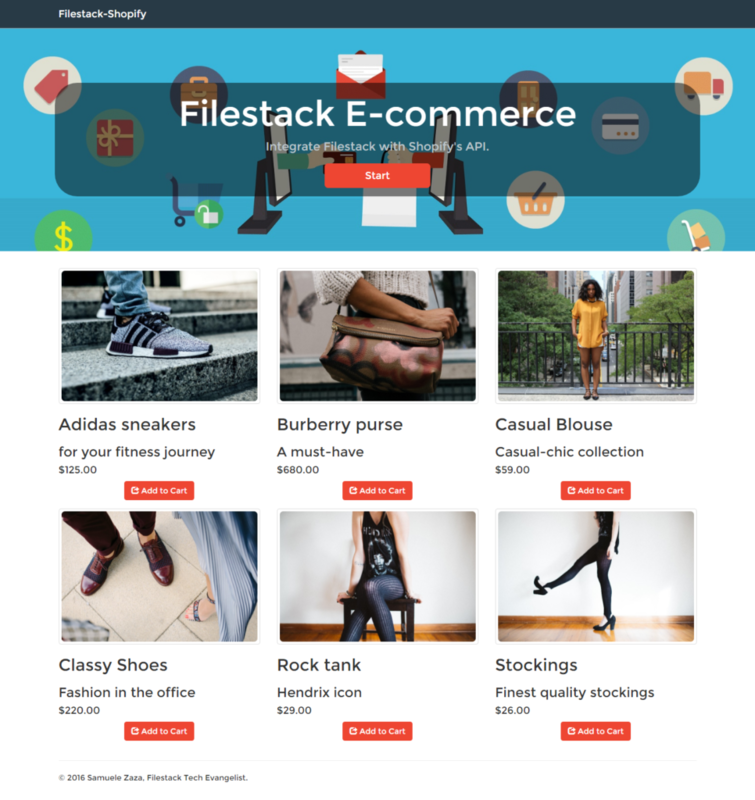 Filestack’s super API for end user content is perfect for uploading images to Shopify, and this tutorial should help you get going in minutes. If you have any questions, definitely reach out to support@filestack.com and we’ll be happy to help. To demonstrate, I’ve build a Fashion Application with two parts. The first part showcases all of the products that buyers can choose from, and the second part allows users to upload pictures of clothing to sell on the platform. I created a sample app with Node.js and I use node-shopify package to interface with Shopify’s API. As usual you can clone/fork the app on my github. That’s all, remember the API key and password! So how do we access Shopify’s API? The option object we are sending in requires the API key and the password that we received from Shopify before. As this point we are almost done because the object has several methods that we can use to access the API. I setup two routes on the /product endpoint, a GET for receiving the list of products and a POST for adding a new product. When the client surfs the homepage, a GET http request is thrown which returns all the products. You can see the Shopify object requesting the products at admin/products.json. This is very similar to the procedure to POST a new product to Shopify. In fact, you just have to make a POST request to the same endpoint with the product as second parameter for the post function. That’s all, thanks to node-shopify it’s so easy to work with this API. Now, let’s go to create a product. For each color you have a variant that can vary (guess what!) in price, color etc. You should see that I defined a single variant with price and sku, which is a unique identifier for the product in the shop. Title, description, picture and price they all come from the client’s input. Obviously the ‘PICTURE_SRC’ will be substituted by Filestack’s CDN link to the picture. We have seen these options before, notice that I take advantage of the onProgress function to create a nice animation on the loading bar. defines the files allowed to be upload, only pictures in our case. set to true will close the modal as soon as a client chooses the picture, this is because we want to show the loading bar in the page. Now if we go back to Shopify’s dashboard, on the left side you can click on products and you will find the newly added one! Congratulations, Shopify and Filestack now successfully work together! We created a private app credentials and use them to connect Node.js to Shopify’s API. Successively we analyzed the steps of creating a new product by highlighting the object structure and used Filestack to upload new product pictures.